Cyberpsychology is the study of how emerging computer technologies, especially social media, affect the way people think, feel, and behave both online and in the face-to-face world. This course explores a wide range of topics concerning this rapidly developing field of psychology, including how individuals, interpersonal relationships, and groups function in cyberspace with both positive and negative consequences for mental health. It emphasizes an understanding of the basic concepts of cyberpsychology along with the implications of this knowledge for improving wellbeing in the digital age. This course is based on the Eight Dimensions of Cyberpsychology Architecture as an interdisciplinary model for understanding digital environments and our psychological reactions to them. The objective of the course is to introduce students to the new field within psychology know as “cyberpsychology,” including the history, theories, research, and practical applications of this new discipline. Cyberpsychology employs traditional psychological concepts in understanding how individuals and groups react to digital environments, but cyberpsychology researchers have also proposed new principles that fall outside the range of traditional approaches. In this course students will be encouraged to think critically about the application of old and new concepts in cyberpsychology, to evaluate research in this field, to investigate the impact of social media and other digital environments on human behavior and mental health, and to understand how cyberspace has affected their own lives. Like many specialty areas within psychology, cyberpsychology now has its own journals, conferences, and culture, resulting in a new academic entity that students will be encouraged to explore. Cyberpsychology introduces students to a new and very rapidly developing area of psychology. Almost everyone, including researchers in all academic disciplines, has been affected by the digital revolution. If we think of cyberspace as new type of environment for the manifestation of behavior, then a cyberpsychology of this new environment will be an important part of the education of many if not all students, especially psychology students regardless of whether they become academics or professionals working in fields related to psychology. A course that focuses specifically on the theory, research, and applications of cyberpsychology as a unique academic and applied discipline would be a valuable contribution to the curriculum. Applying the Eight Dimensions of Cyberpsychology Architecture to understand the psychological impact of different digital environments; how these dimensions can explain environmental and interpersonal presence. The expression and management of identity in cyberspace; how different personality types behave online; compromised identities in cyberspace; the integration of the online self with the in-person self; the psychological ingredients that contribute to the online disinhibition effect. 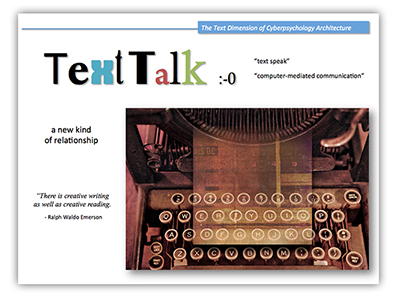 The psychological and interpersonal aspects of communicating using text; the effects of absent face-to-face cues; differences between long and short forms; the psychological dimensions of email messages; creative keyboarding techniques; mobile texting. Avatars as manifestations of identity in a virtual reality; how avatars hide, reveal, and transform aspects of self; a psychological classification of avatars; avatars as vehicles for enhancing kinesthetic and physical experience. The life cycle of online groups; techniques for assessing groups; the psychological dynamics of work groups and digital classrooms; the struggle to find one’s cyberpsychological niche in social media. The psychological ingredients that help or hinder people when faced with media transitions; media transition motivation; media transition anxiety; media mental sets; the symptoms of cognitive overload; strategies for dealing with cognitive overload; cyberspace mania. The distinction between being devoted or addicted to online activities; controversies about Internet addiction as a new mental disorder; the signs of excessive Internet use; the various types of Internet addiction; the psychological needs underlying these addictive behaviors; remedies for pathological Internet use. Online deviance in its various forms and levels of severity; inappropriate images; cyber-bullying; identity theft; sock puppets; hostile and lewd language; scams; hacking; the psychological motivations underlying online deviant behavior; strategies for dealing with deviance. The psychological significance of virtual realities that mimic the actual world or create fantasy-driven experiences; cyberspace as a dream world; artificially intelligent beings that mimic humans; virtual representations of a human personality; the psychological assessment of artificial intelligence. A zip file containing sets of powerpoint slides for each of the topic areas listed above, 250 mb. A pdf that includes sample syllabus, student exercises, and online resources, including videos. A collection of images in Google+ that to illustrate basic concepts in cyberpsychology. Feel free to use. A web page that summarizes this interdisciplinary model for understanding digital environments and psychological reactions to them, including how to use the model in research and in the assessment of an individual's lifestyle. Includes multiple-choice and true/false test items. Suler's ongoing essays about contemporary issues in cyberpsychology. Suler's video that summarizes the birth of cyberspace and cyberpsychology, and that highlights important concepts in cyberpsychology. 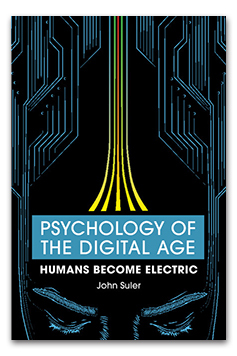 John Suler's original work, published online, the first book written about cyberpsychology.